Timed to coincide with the 4th berlin biennial, mono.kultur #05 is dedicated to its curating team consisting of Maurizio Cattelan, Massimiliano Gioni and Ali Subotnick. The curatorial power trio first started collaborating on the tiny art space The Wrong Gallery in New York’s Chelsea district which didn’t consist of much more than a door, but had artists such as Lawrence Weiner, Tino Seghal and Elizabeth Peyton grace its one square meter. They also initiated the art publication ‘Charley’ as well as temporarily running the guerrilla art franchise Gagosian Gallery Berlin under the involuntary patronage of New York’s most powerful gallery. The 4th berlin biennial is the largest and most encompassing collaboration of the three to date, while they pursue their individual careers in curating and creating art with astounding success. With mono.kultur, Maurizio Cattelan, Massimiliano Gioni and Ali Subotnick talked about their approach to curating, the state of the avant-garde and the importance of failure. 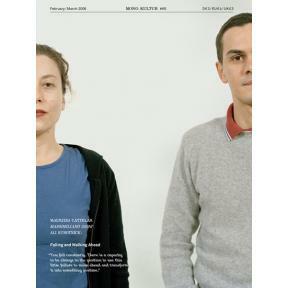 The issue is illustrated with portraits of the staff behind the 4th berlin biennial, from its curators to the interns and technicians.